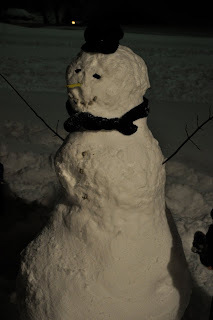 It snowed so much that we were able to have our first snow dude this winter. It started snowing yesterday and we got at least 10 feet I guess. Today we had a good break but all the neighbors who tried to get out ended up going back to the house. We're stuck. If I run out of diapers we're going to cloth diapers :) We can hold on for a little while with those. It shouldn't be that bad. My real plan is to walk to the neighbors' house if I ran out and borrow some. The food has been great. Today my husband made the best chicken ceasar salad I've ever had. I'm so thankful! I missed his cooking. This snow came with a lot of benefits, lots of family time all snuggled in. I pray for the folks who do not have electricity. There are thousand in one of our neighbor counties who won't have anything til Monday. What an interesting way to enter Christmas season! It look like the main streets are clear but our little neighborhood is covered. The weather is supposed to clear on Monday, let's see how long will take the streets to get cleared. We watched our memories from 2008, what an incredible year it was! After I watched it I realized I was/am pregnant twice in 2009. It will be interesting to look back.